The bird on the home page might quickly be identified as a raptor of some kind. Obvious marks are a long, banded tail on a generally trim looking bird despite the cold weather. A little bit of red barring can be seen on the feathers on the right side of the bird. 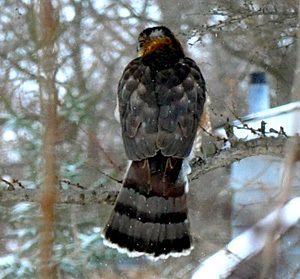 The combination suggests something like an adult Cooper's or Sharp-shinned Hawk. Which do you think it is? Send your suggestions to: whichbird@namethatbird.com. 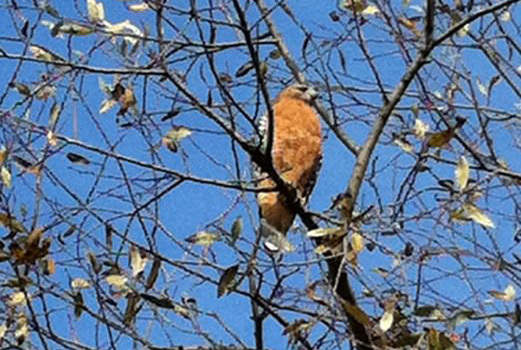 Red-tailed Hawks are large, heavy-bodied hawks with a wide range of plumages. Immatures have a banded tail.